This is an activity that was suggested by the kindergarten teachers from my son's new school. 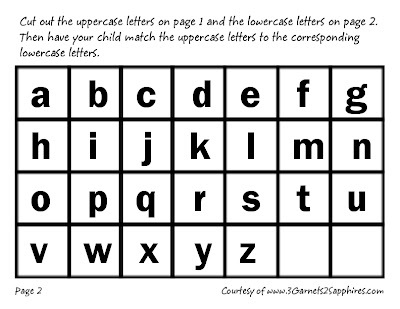 The idea is to cut out the squares from both pages and have your child match the upper and lowercase letters. Since my son is pretty familiar with the lowercase alphabet, he found this activity to be a little easy to complete, aside from the fact that he inadvertently dropped two letters on the floor. So if you think this activity won't challenge your child enough, then you can remove one or more of the letters from the pile to make it a little more interesting. 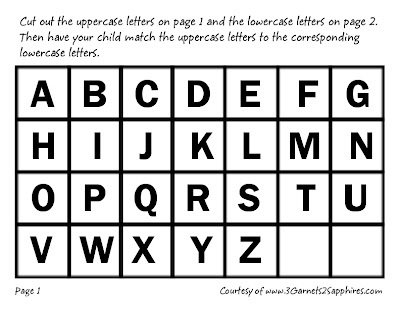 You can make your own squares by writing them out by hand or you can print the ones I created below. 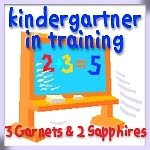 To print each page, simply click on the image to show the full size version, then right-click on it and select "print picture".